Petechiae are small red spots that appear on the skin and are typically red, brown, or purple. They are the result of tiny capillaries discharging blood underneath the skin. There are many reasons for the formation of petechiae. These reasons can fall anywhere in a wide spectrum of severity, from minor to very major. Size. Petechiae are typically around .05-1 mm in diameter and not more than 3mm. Location. While petechiae can form pretty much anywhere on the body, they are most commonly found on the legs, face, ankles, back, thighs and shoulders. Color. Petechiae initially begin usually with a red color and then turn to blue or purple. Don’t fade with pressure. The greatest identifier is to apply pressure to the area. If the spots do not fade or lighten, they are most likely petechiae. Prolonged straining. Excess straining from coughing, vomiting or crying are the most common causes of petechiae. In these cases, the rash-like rupture spots usually form on the face, especially around the eyes. Childbirth and weightlifting are additional examples of strain-induced petechiae. These types of petechiae are typically harmless and disappear in a few days. Specific types of injuries. Strangulation, smothering, biting and spanking can cause petechiae. Severe sunburns can also cause the formation of petechiae. The best way to treat and manage petechiae is to correct the underlying cause. While petechiae from physical trauma tends to heal itself in a matter of days, petechiae related to a more serious underlying condition does not. Failure to treat serious conditions that could be causing your petechiae can result in irreversible complications and damage. Don’t wait. 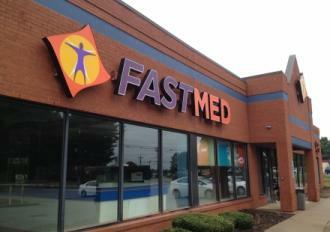 Contact your local FastMed today, and meet with one of our experienced healthcare professionals. Together, we can work to pinpoint the cause of your petechiae and form a treatment plan specific to your needs. We work hard to make healthcare accessible, even with your busy schedule. Hear from some of our healthy and happy customers and come experience courteous, comprehensive care at FastMed.